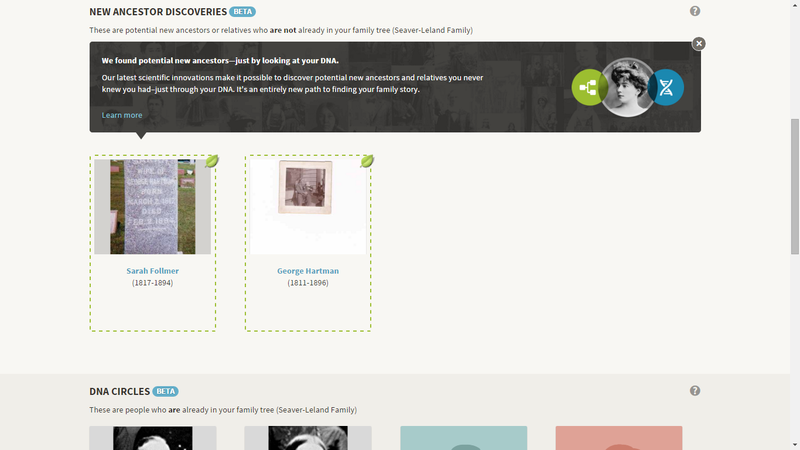 Ever since the announcement of New Ancestor Discoveries by AncestryDNA, I have not received any - until yesterday. Now I have two - a husband and wife - George and Sarah (Follmer) Hartman of York County, Pennsylvania. I know that I don't have George Hartman (1811-1896) and Sarah Follmer (1817-1894) in my family tree - could I have made a big mistake? They apparently resided in York County, Pennsylvania, and I do have several York County families from the 1750 to `1820 time frame - Spangler, Konig, Ruth, and Dinkel - my 4th great-grandparents. 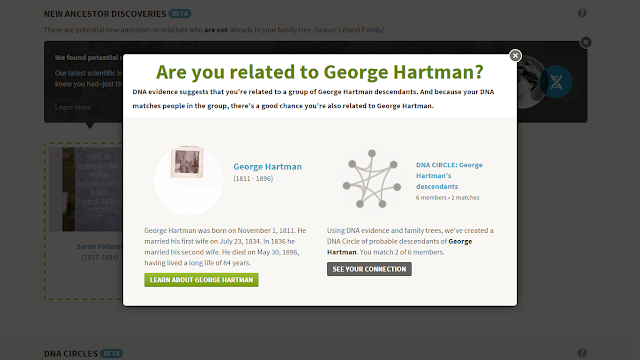 I was curious, so I clicked on the link for George Hartman. 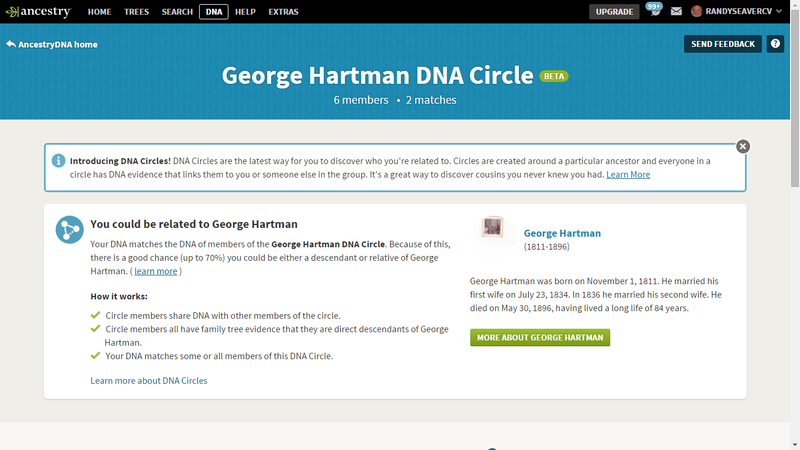 That opened a popup screen that indicated there were 6 members in AncestryDNA who shared this DNA, but only two share it with me. 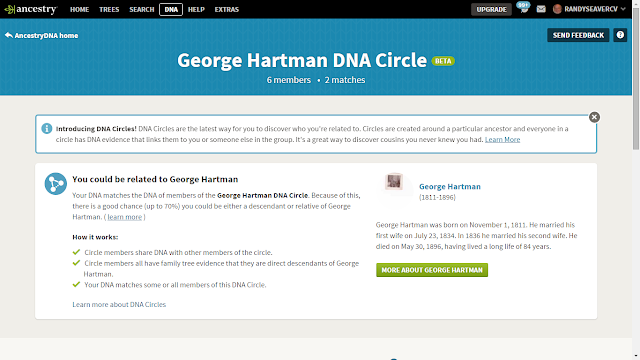 "Your DNA matches the DNA of members of the George Hartman DNA Circle. Because of this, there is a good chance (up to 70%) you could be either a descendant or relative of George Hartman. " 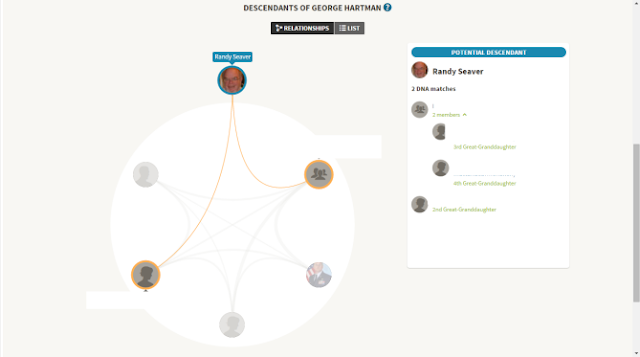 One of my matches is a 2nd great-grandchild of George and Sarah, another is a 3rd great-grandchildren, and the other one in the group is a 4th great-grandchild. Well, I don't see any of my known York County, Pennsylvania families on the chart, and they go back to births in the 1700-1720 time frame. 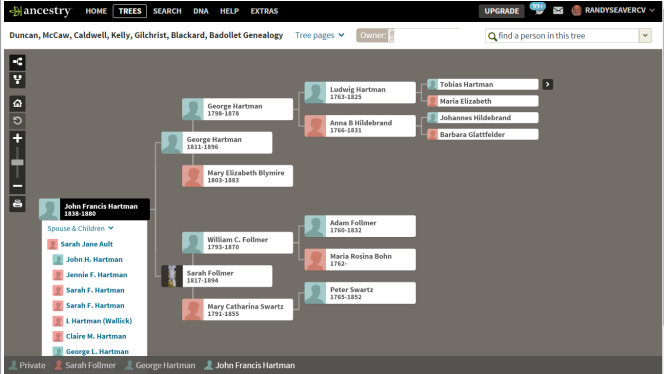 There are some unknown parents on the pedigree chart, so they may be from my families but have not been connected yet. 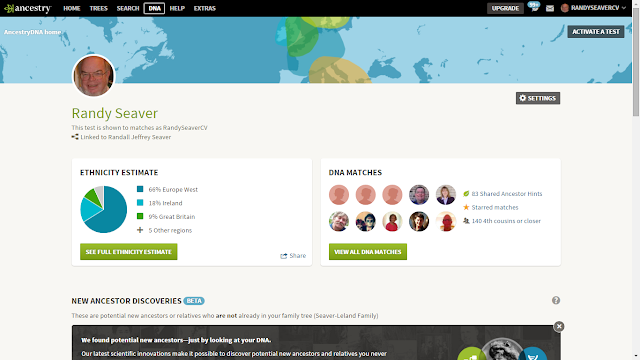 I also looked at my three purported DNA matches and found them in my AncestryDNA match list. * The first one is a predicted 4th cousin, sharing 28.4 cM in 2 segments. This match does share some common ancestral names with me - especially Hazard, Freeman and Paine from New England, but these are back several more generations. * The second one is a predicted 4th cousin, sharing 22.7 cM in 1 segment. I have some shared surnames, but not in the areas their families resided. * The third one is not shown as a DNA match. I know that other researchers (and geneabloggers) have not had very good luck with these New Ancestor Discoveries. I'm sure that there have been some, but I don't recall any that were written about. 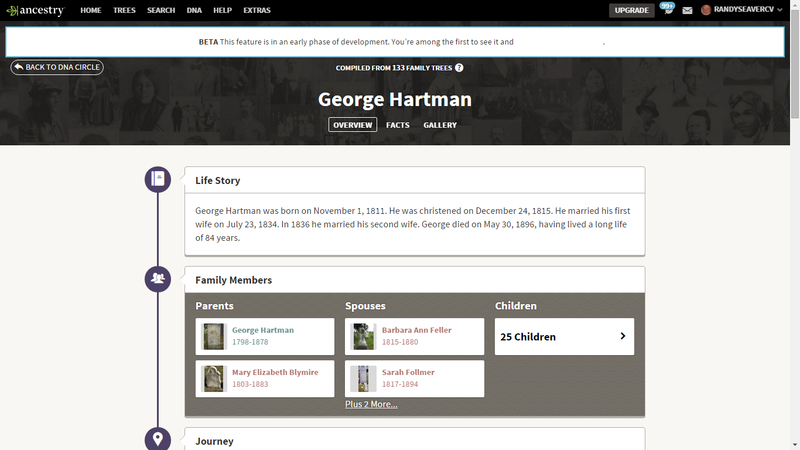 AncestryDNA says the likelihood of my being related to George and Sarah (Follmer) Hartman is 70%. My guess is that it's much closer to 0%.